Margaret and John Cornall were dubbed Victoria's oldest parents when they used advances in IVF techniques to have Allen on June 7, 1990. They were 50 and 55. Ms Cornall, now 70, had already been sterilized and through menopause, drawing strong criticism from many in the community who claimed she had put her own needs above those of the child whose life she may not live long enough to share. 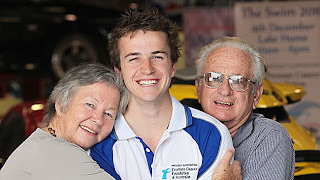 But as the proud parents watched 19-year-old Allen graduate from his first year of motorsport studies at Wodonga TAFE yesterday, they were keen to let the world know they are very much still around to support the son who has grown into a caring adult. -- Polycystic Ovary Syndrome is the most common hormonal disorder among women of reproductive age, and if left unchecked, is linked to serious health issues like infertility, type 2 diabetes, heart disease, and endometrial cancer. In this groundbreaking book, registered dietitian Hillary Wright explains this increasingly diagnosed disorder and introduces the holistic symptom-management program she developed by working with hundreds of patients. With Wright's proven diet and lifestyle-based program, you can influence your reproductive hormones and take charge of your health. Featuring a carbohydrate distribution approach at its core, The PCOS Diet Plan also zeroes in on exactly what exercise, supplements, and self-care choices you can make to feel better every day. Start reading The PCOS Diet Plan on your Kindle in under a minute!